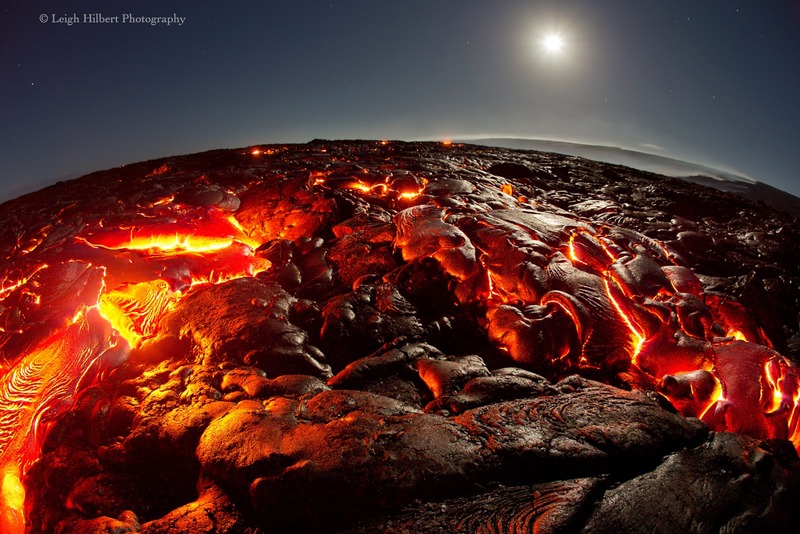 Leigh makes a January 2017 quick visit to the molten lava! 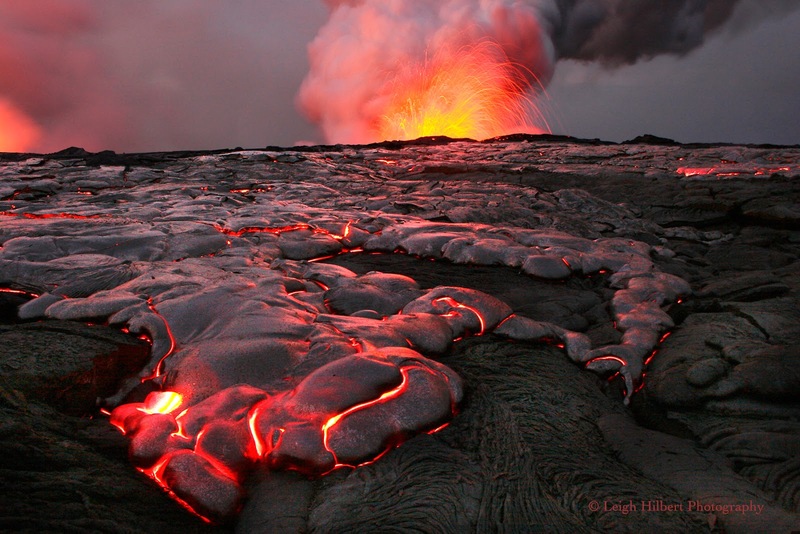 I started this blog in 2009 to share our local molten lava eruption while it was flowing down the south slopes of Hawaii Island. 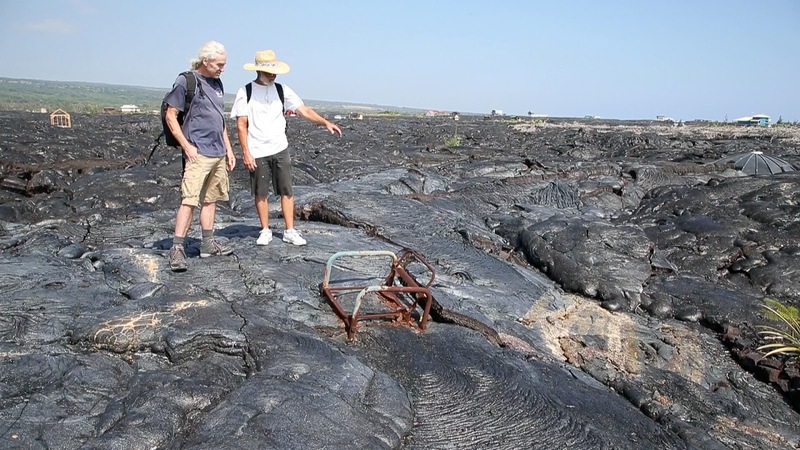 It had, of course, already been flowing down to the coast for many years, but around that time the surface lava became more accessible for those living on the Puna side of Hawaii Island. 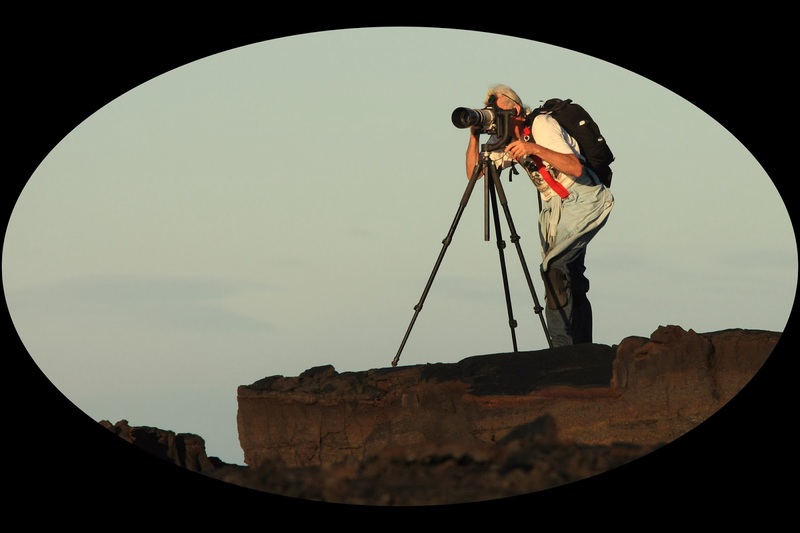 Plus, I went digital in 2007, allowing me to more easily share my passion for photography. 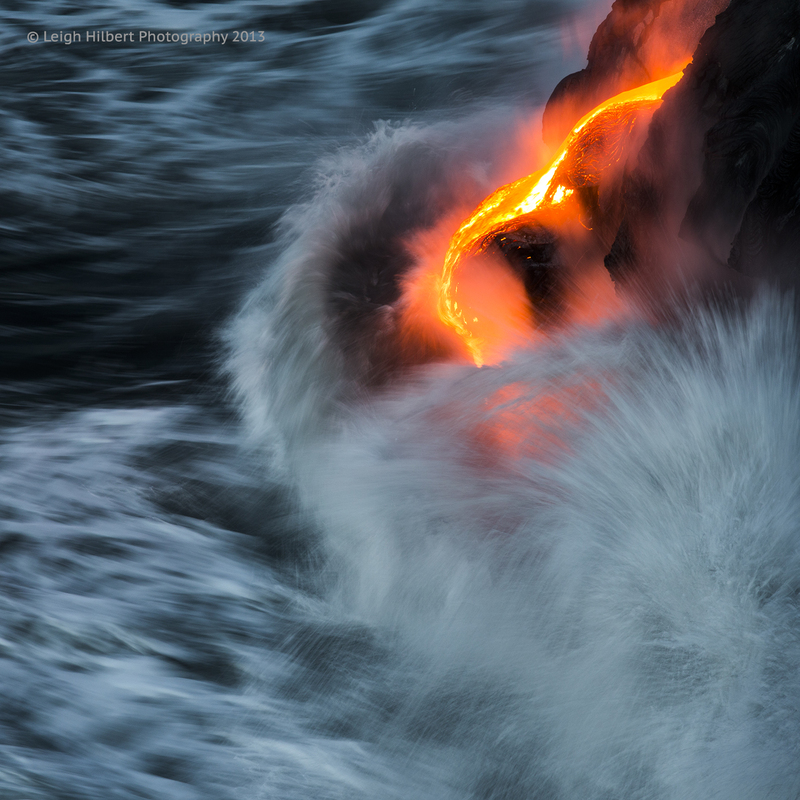 Since last fall, the lava slowly ceased entering the ocean, so this ‘Daily’ has become rather quiet . Even before that, I was offering fewer updates as the months slid by. 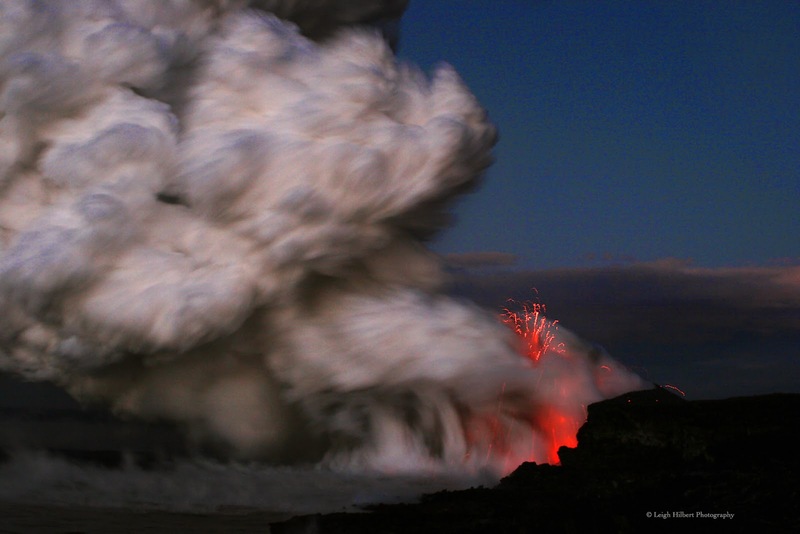 It was never my intention to create anything remarkable with this blog. 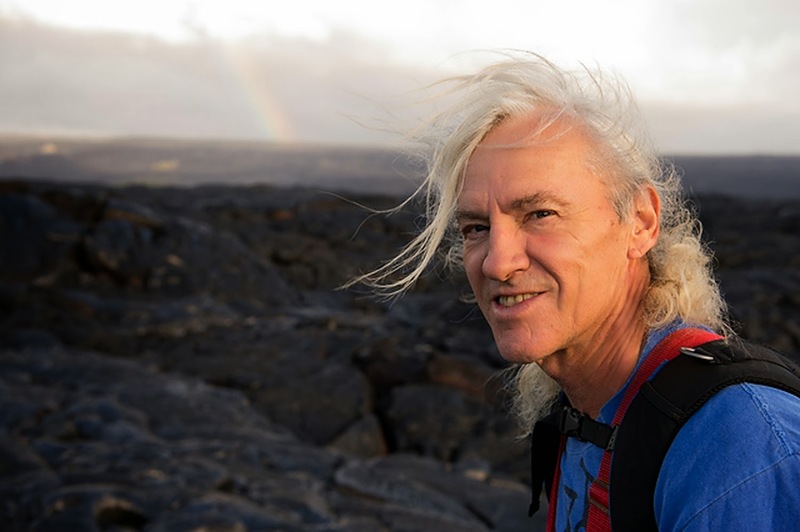 I simply wanted to share what I was already doing – hiking to the lava flow and documenting it with video and still photography. For the first time ever I just looked at the “page views” for this blog. It’s at 690,696 as of today. 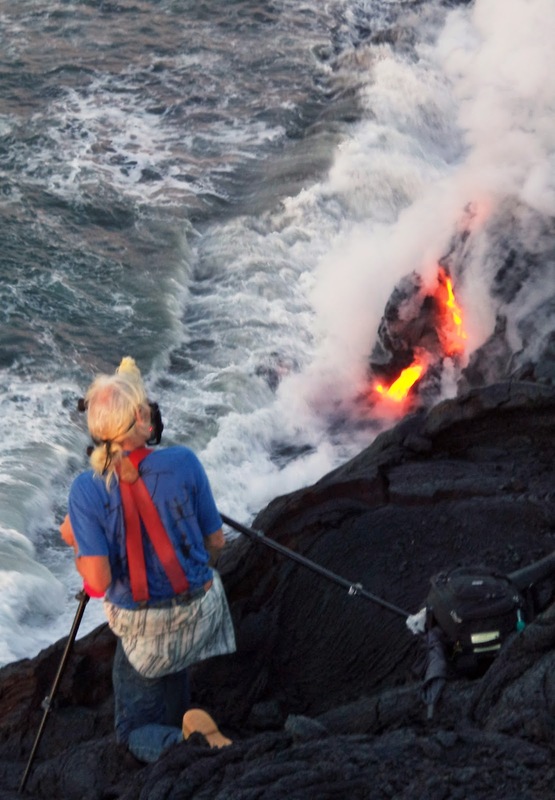 Wow – I had no idea! Erupting lava that you can walk right up to and see moving with your own eyes; watching raw earth being formed before you so close that the heat from it is searing, the fumes are stinging, the newly cooling lava is hissing, snapping and popping - where molten rock entering the ocean explodes into fireworks of glowing fragments while simultaneously, and instantly, creating a black sand beach ... well THAT is a world wonder! I just had to share it all somehow! And so ... I began this blog to allow others to witness, through my camera lenses and words, this amazing excretion of the earth’s magma core. The coastal lava phase of the eruptions has ceased for now. 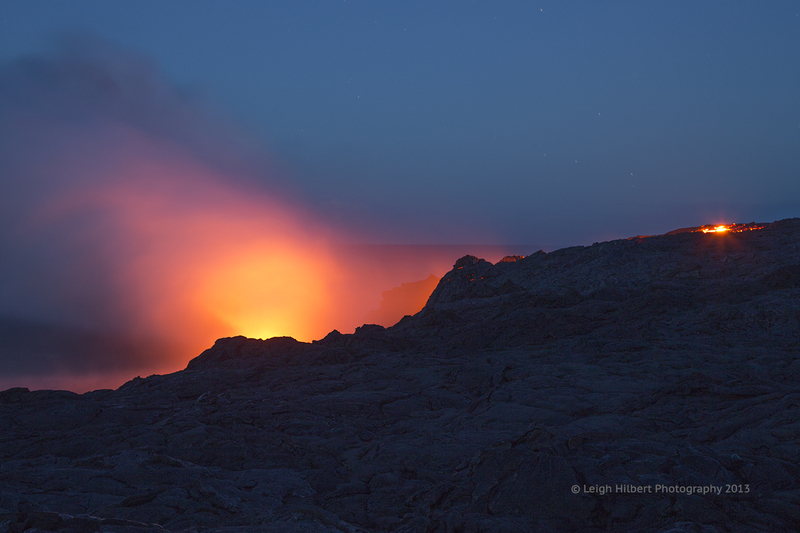 Although molten lava continues to erupt from the earth as surface flows here on the Big Island, as I will detail a bit further down, it was hard to hike to, not all that exciting, smoky & hot; I no longer was documenting it, other than the occasional posting I have made in recent months. 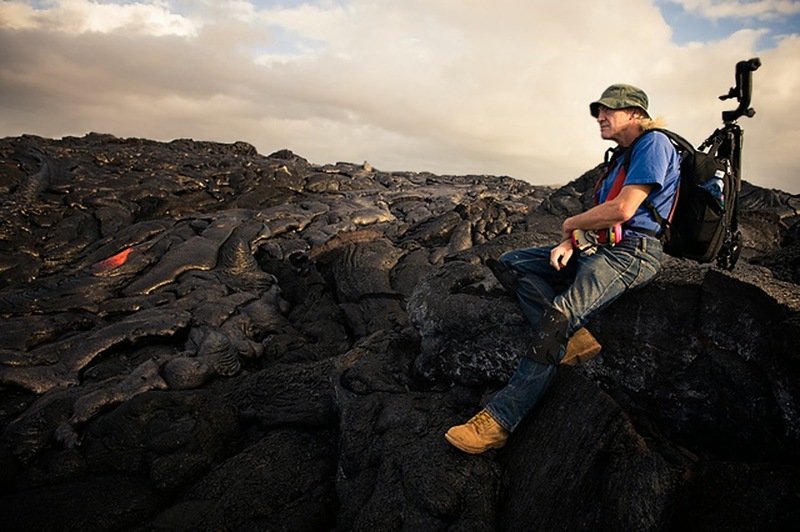 This lack of accessible molten lava, combined with my desire to be back on the mainland with my family – 5 grown children and 5 granddaughters – has lead to this: Tomorrow I am leaving the big Island, after 16 exciting years of documenting its coastal lava flows. When documenting all of this activity, I almost always left home well before daylight and hiked into the surface flow action in time to record the spectacular scenes in the pre-dawn, and dawn, light; daylight detail with red-orange lava glow. Sometimes the hikes were short, others were many miles and uphill and lasted a couple of days. 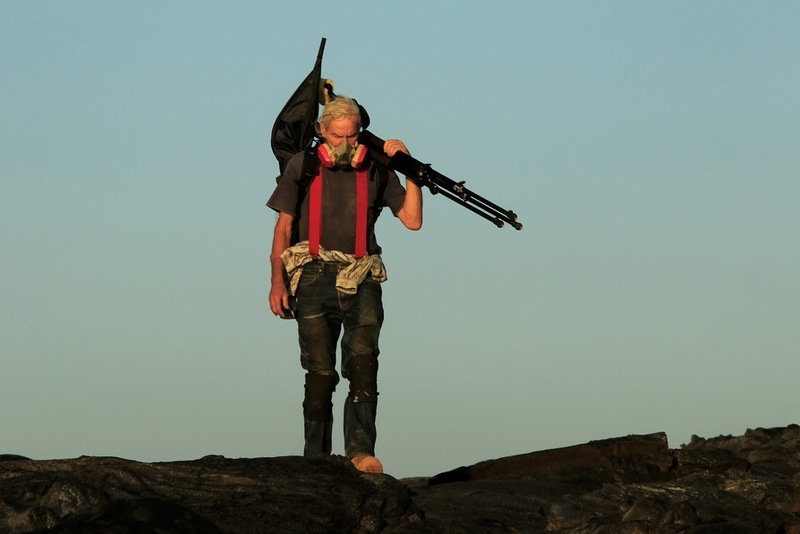 (I carry a lot of weight on my back for those; like extra water, and food, along with my heavy camera gear. (Two and a half of those years I did this with a compound sprained right ankle). 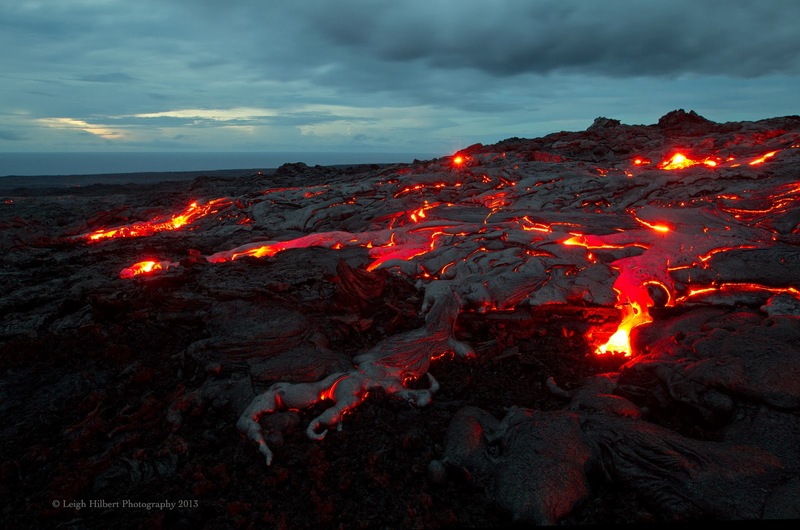 I napped beside glowing lava to keep warm on overnighters - I had no room for extra clothing. 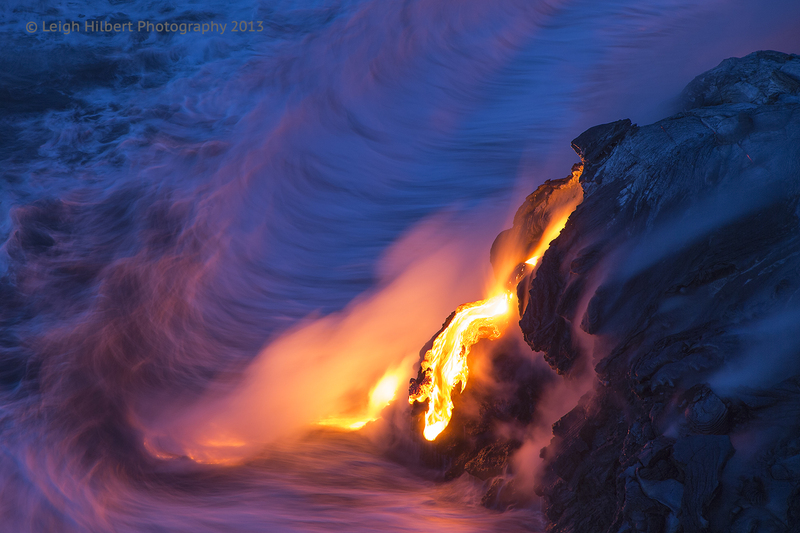 When activity was really exciting, I would return to the lava flow front after only a few hours sleep – sometimes for days on end - and somehow still made the time to upload & process my latest photos and write the day's blog before heading back out the door to the lava; exhausting but also a pleasure. So I want to give out a really big Thank-You! 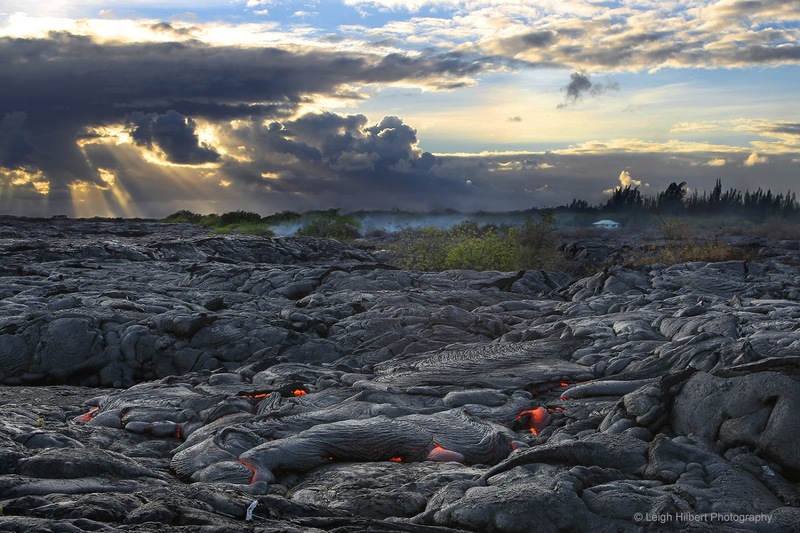 to all of you who have come along for the Hawaiian Lava Daily ride! 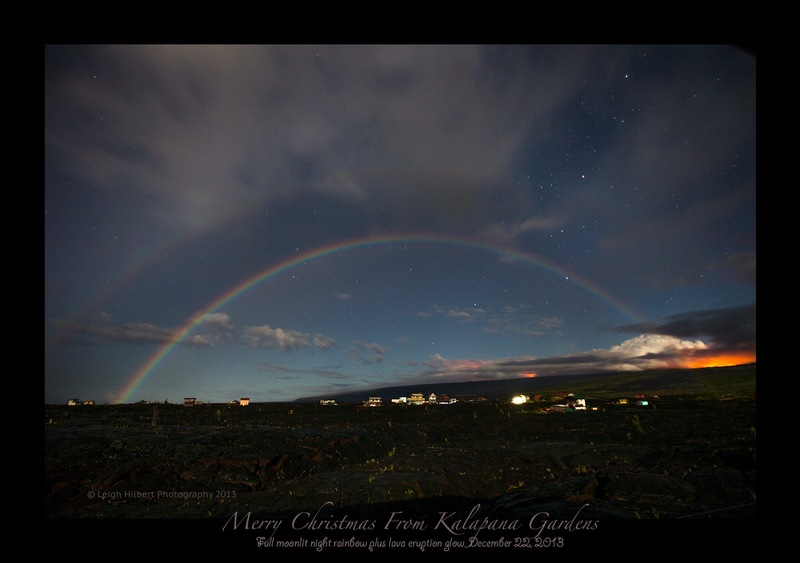 I appreciated those who emailed me, or posted here, with such kind and supportive comments about my stories, photos and videos. Each one meant a lot to me. 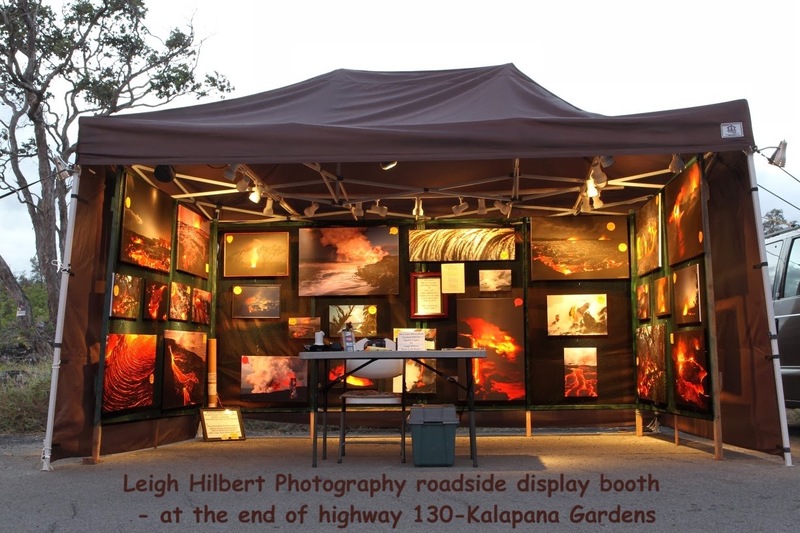 It was also a treat to meet many of you while you visited the island, or you locals and friends that came by my lava photo display booth to talk story. Speaking of that documentary, NBC Universal is currently developing a special presentation based on my movie. I do not know yet when it will be aired on their cable network. 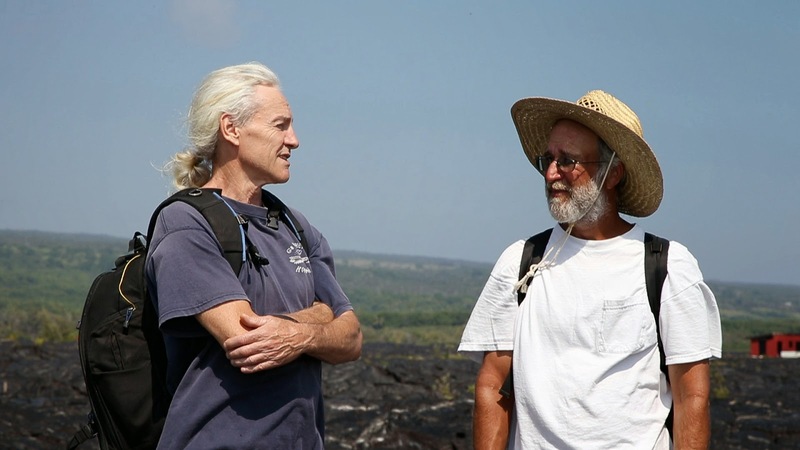 They were just here a few weeks ago interviewing both Gary and me. 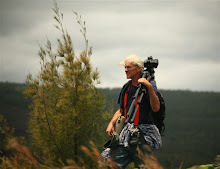 I shot some of the footage of Gary looking over his burned out homestead for them. 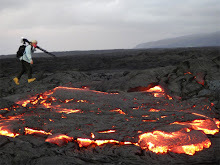 AND, Gary has just bulldozed a new road into his otherwise lava-severed property! He’s going to build out there again! The NBC producer, Lauren, took these two photos of us. 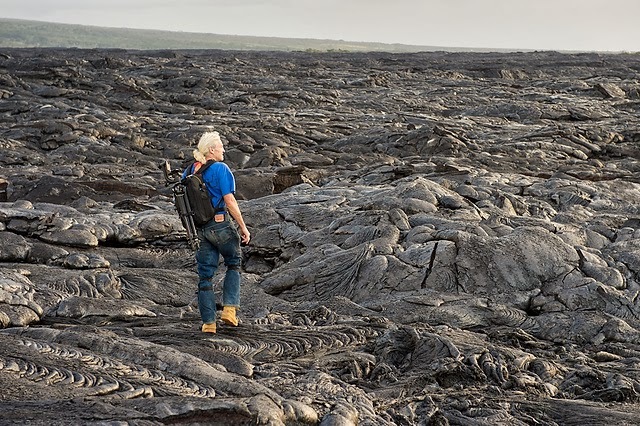 So while Gary reclaims his Kalapana land, I reclaim the lands I was born and raised on - the Pacific Northwest coastlines. March 2nd, 2014: As you likely already know, lava is currently erupting inside the contained crater floor vent of Halema`uma`u Kilauea caldera within the appropriately named Hawaii Volcanoes National Park. 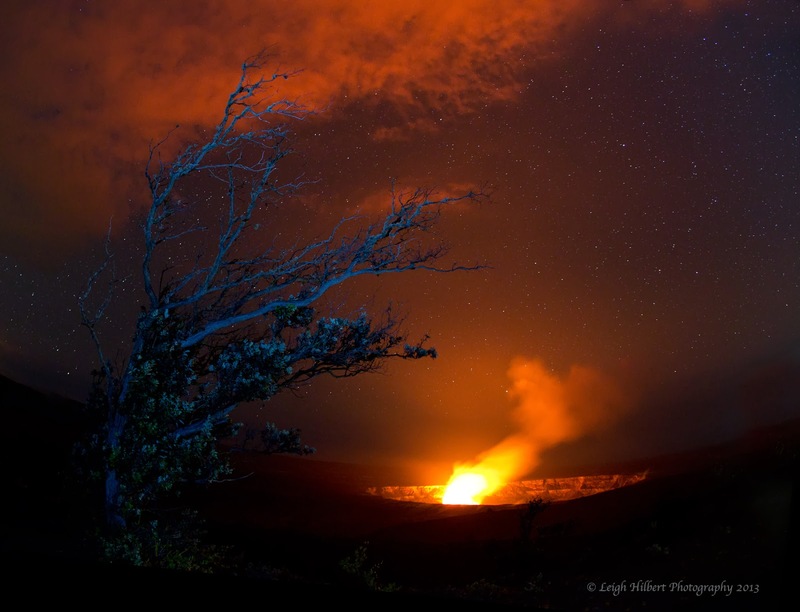 The other active eruption is within the Pu`u O`o crater at the park’s most easterly boundary, seven miles northwest of Kalapana, where lava broils within the swollen crater. 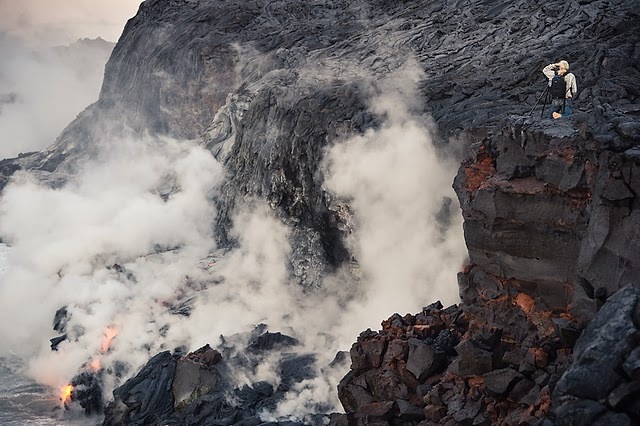 Meanwhile, eruptive fissures along the east flanks of Pu`u O`o also host a surface flow of lava, named the ‘Kahauake’e 2 flow’, which is presently 4.8 miles east-northeast of the crater (see USGS updates link above). 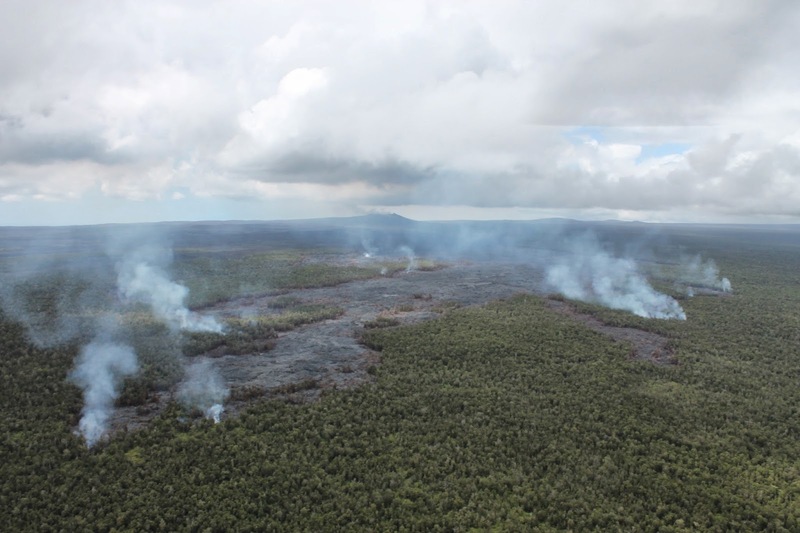 This flow is randomly, and slowly, advancing into remote forests only a couple of miles southeast from the community of Glenwood - slightly uphill to the north, about five miles west of the town of Pahoa, and a few miles south of Hawaiian Acres subdivision. 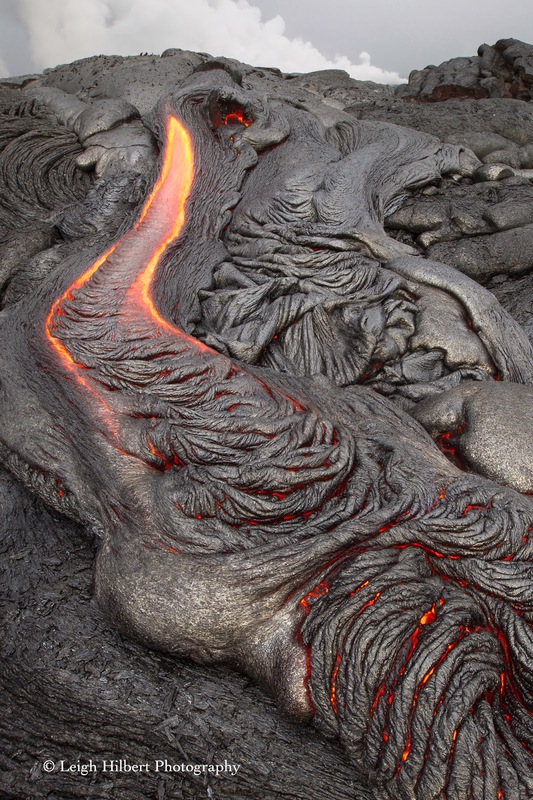 Its advancement is very much affected by magma chamber inflation and deflation beneath Kilauea Volcano, and is flowing across relatively flat & unoccupied lands… But, the terrain there does lean down slope and is blocked on the south by the higher Kilauea’s east rift zone pu`u cinder cone alignment. 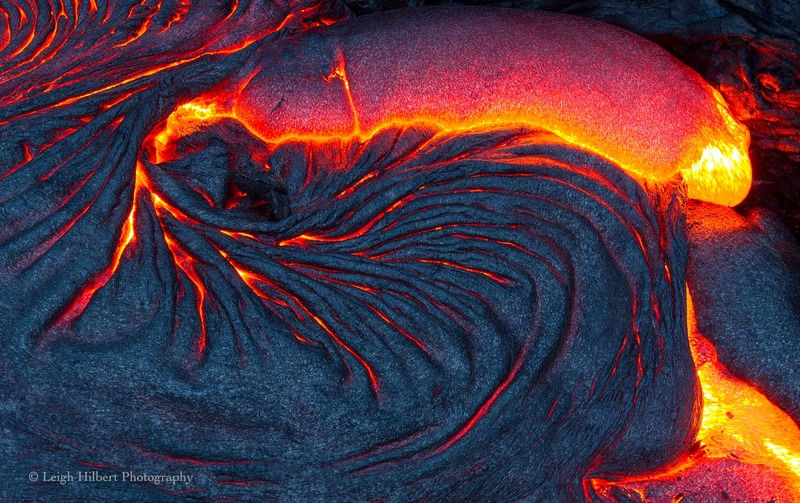 Surface lava flow field: the brighter red on map below. 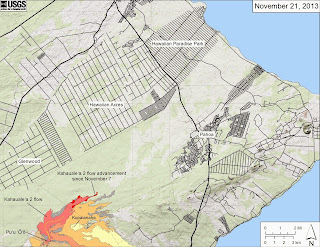 2014 USGS/HVO surface lava flow map and have added some sloppy green lines indicating the general area I think the lava could possibly flow in to if it somehow continues advancing; might take years to get there, if ever, … But if it did, it sure would make for some interesting times in the lower Puna district! The wind damn-near gave me a mohawk ! In the double night rainbow photo you can also see the lava glow from three different eruptions. 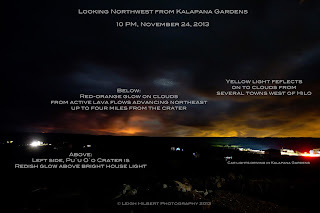 They are along the distant horizon left to right: Halema`uma`u Crater within Hawaii Volcanoes National Park, Pu`u O`o Crater eight miles north west of Kalapana Gardens, and the broader glow from molten lava surface flow breakouts three to four miles northeast of Pu`u O`o. 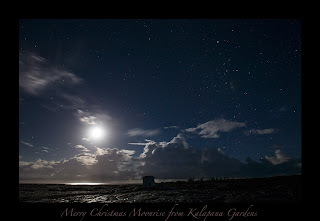 Wishing you all the very best for our new year!! 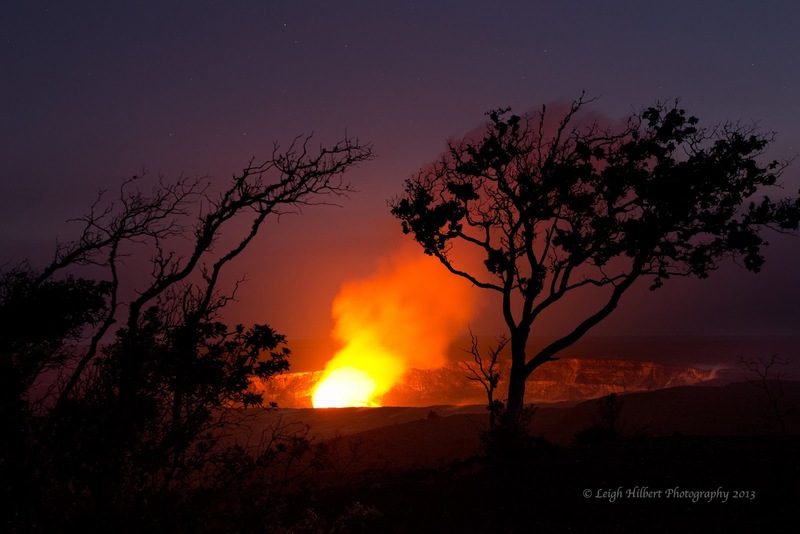 Kilauea Volcano: Both big active craters in Hawaii Volcanoes National Park continue to erupt. The sky was beginning to clear a little after a few days of voggy & rainy conditions. 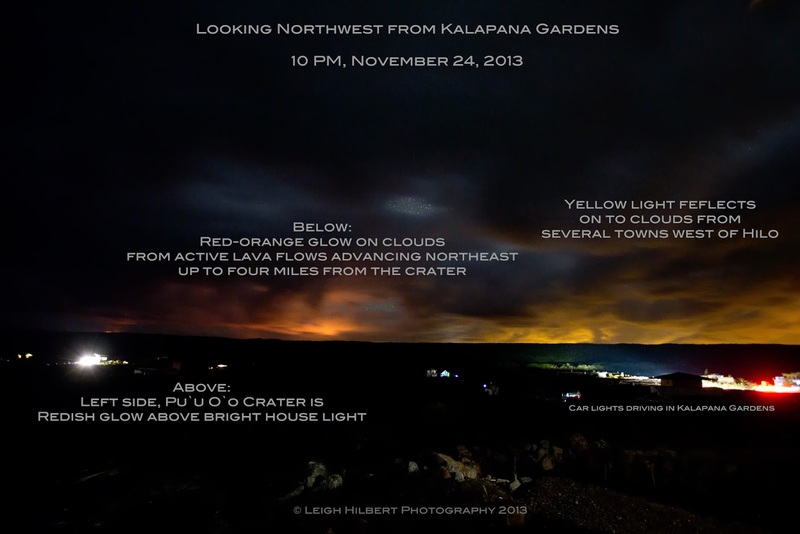 Below is a photo taken last night and has notes on it explaining what is in the scene: Click on any of these images to open into a larger view mode. 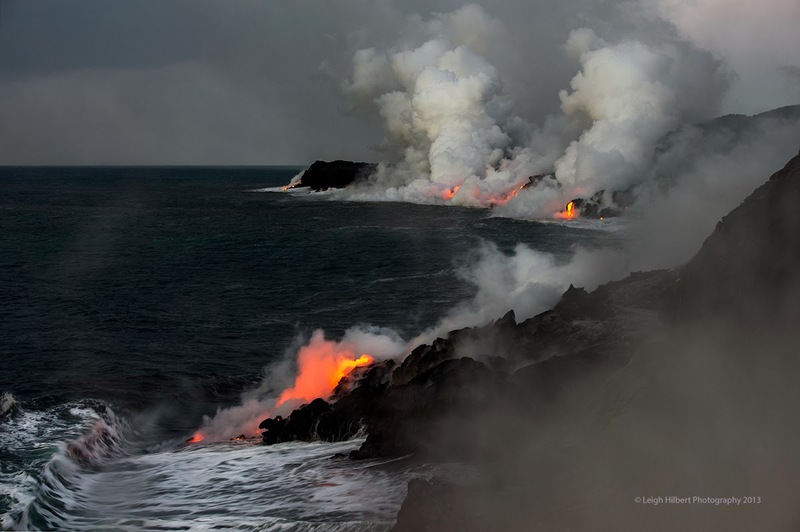 This lava flow is being informally called Kahauale`a 2 by HVO staff, and has been slowly advancing northeast for about six months. 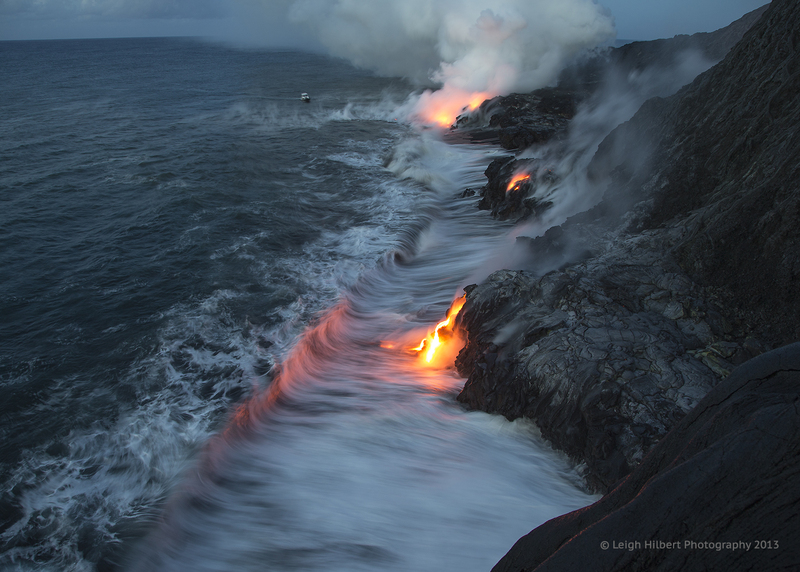 The ocean entry lava began shutting down late August 2013 and has not returned thus thrusting all surface lava into the present flow front. 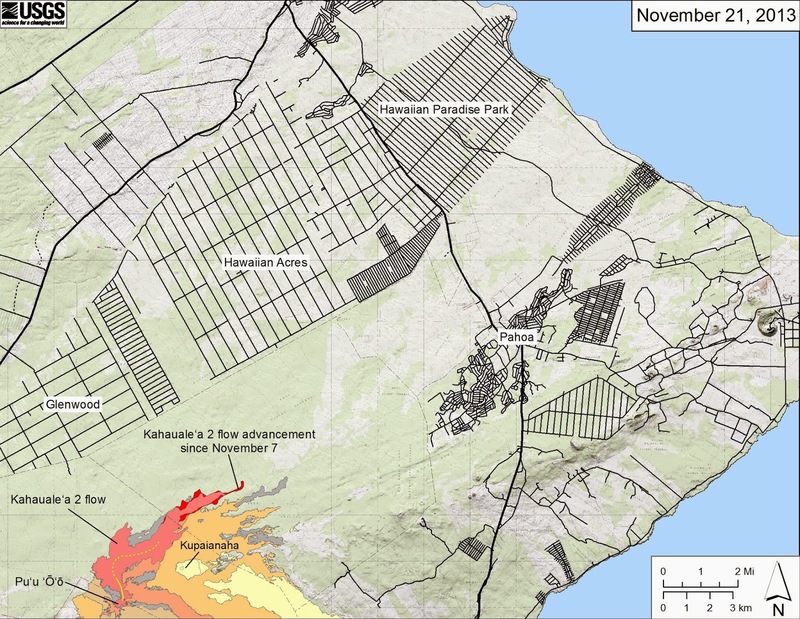 And above, a broader view showing the nearest homes and communities, Note that the community of Glenwood and the southwestern corner of Hawaiian Acres are about three-miles from the flow front, those areas are on higher elevation than the active lava. 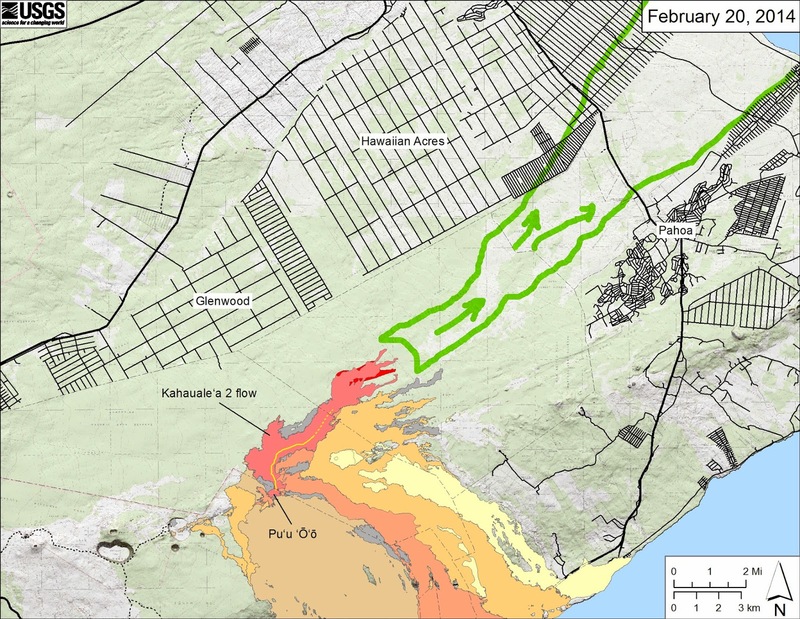 But downslope, the southeastern sections of Hawaiian Acres and Pahoa town are just a little over five and a half miles from the most active leading tip of this surface flow. 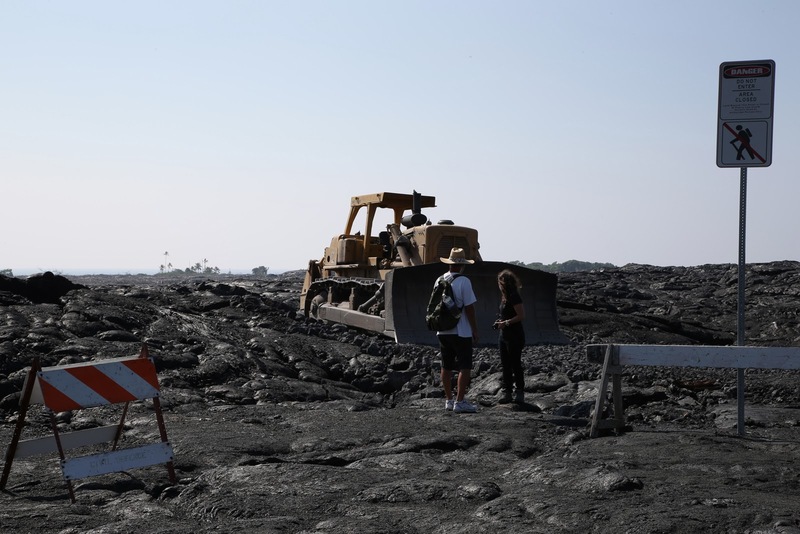 No one can predict whether the Kahauale`a 2 will continue this advancement for months to come and threaten communities and highways, cease tomorrow or rip open a new fissure and go somewhere else … History shows that only one thing that seems rather constant is the Hawaiian Island chain continues to grow and Pele is in charge. 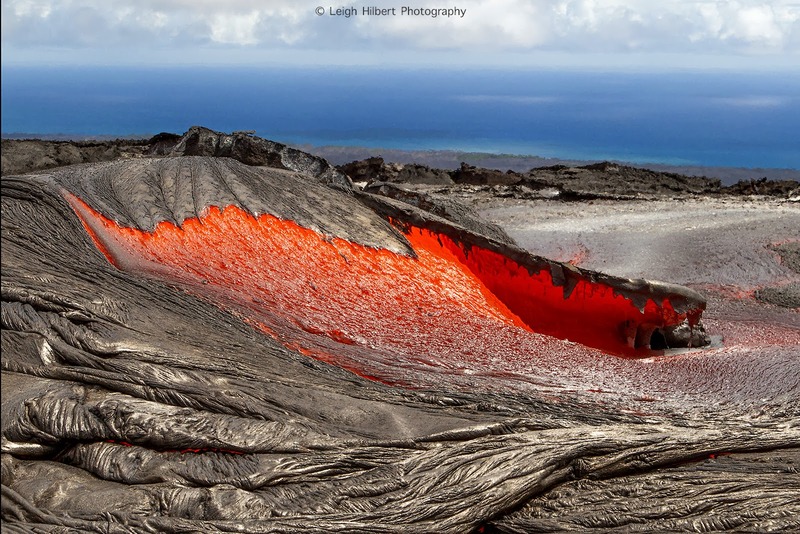 [EDIT: September 10, 2013 -- Lava is no longer entering the ocean or even flowing on the coastal plain for the last week and a bit. 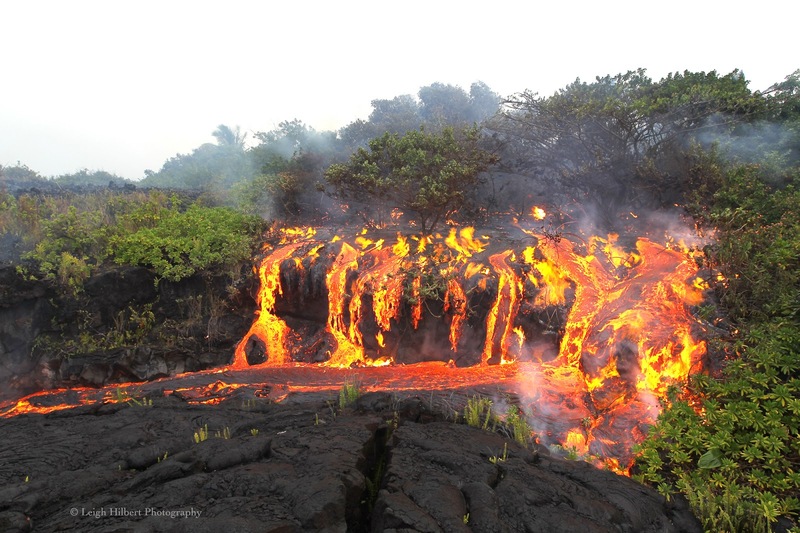 Molten lava is flowing on the north side of Pu`u O`o crater in a very remote region. 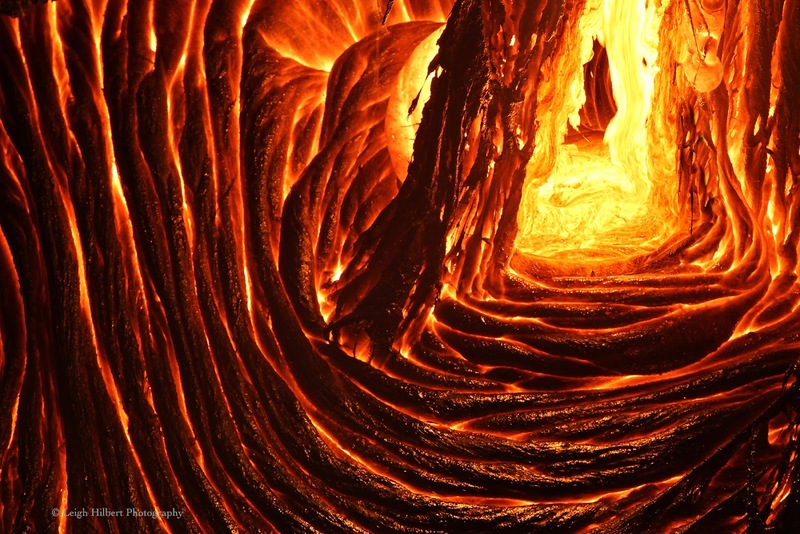 The lava tubes leading south towards the ocean remain hot inside and could rupture open again anytime. 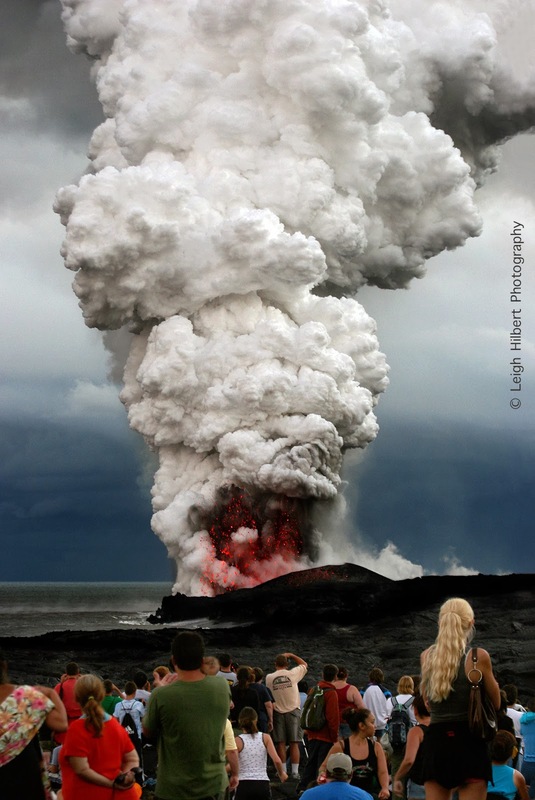 Little has changed with eruption activity since this posting two months ago. 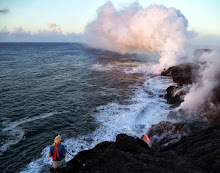 For nearly six months now the current eruption out the south flank of Pu`u O`o crater has been entering the ocean three miles southwest of Kalapana Gardens subdivision. 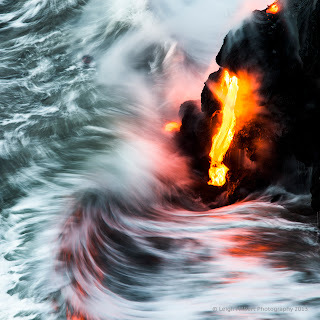 The ocean entry scene has remained nearly the same for months; a small lava bench builds out and keeps breaking off, random surface breakouts from the sealed over delivery tubes come and go, entry points are usually at two main places – occasionally there are more. Yes it is way overdue from when I predicted (several times) it would be all done. All of you wonderful Hawaiian Lava Daily blog readers who so kindly supported me on this movie will be receiving a handcrafted DVD version of the final draft. As of now, these have all been mailed out and should arrive at whatever speed the snail can travel. If you did contribute but don’t receive a copy within a couple weeks (US) then email me and I’ll get one out to you. Outside the US will take a little longer. Also, with most of the DVD’s I sent have a letter and a page about offering me feedback on the pluses and minuses of the movie as you see it. (Please forgive my use of the ‘you’re’ instead of ‘your’ in the big, bold, heading line!) 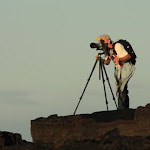 I will still have one more chance to tweak the film before commercial production begins. These question-answer forms are not meant for you to PO mail back, but to give you the idea. Just email me when you get it and I’ll email back the questions for easier exchange. I don’t have any DVD’s of the movie available for sale yet, but when I do I’ll post that on here. 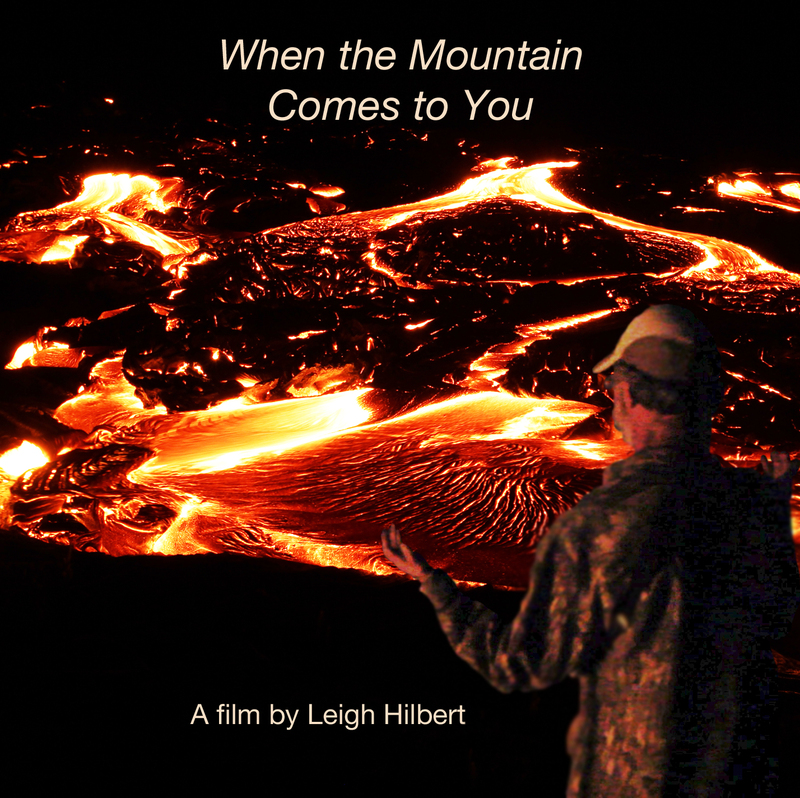 I still need to finish the licensing of the movie music before I can commercially do a large printing, or do film festivals etc. But I am on it!